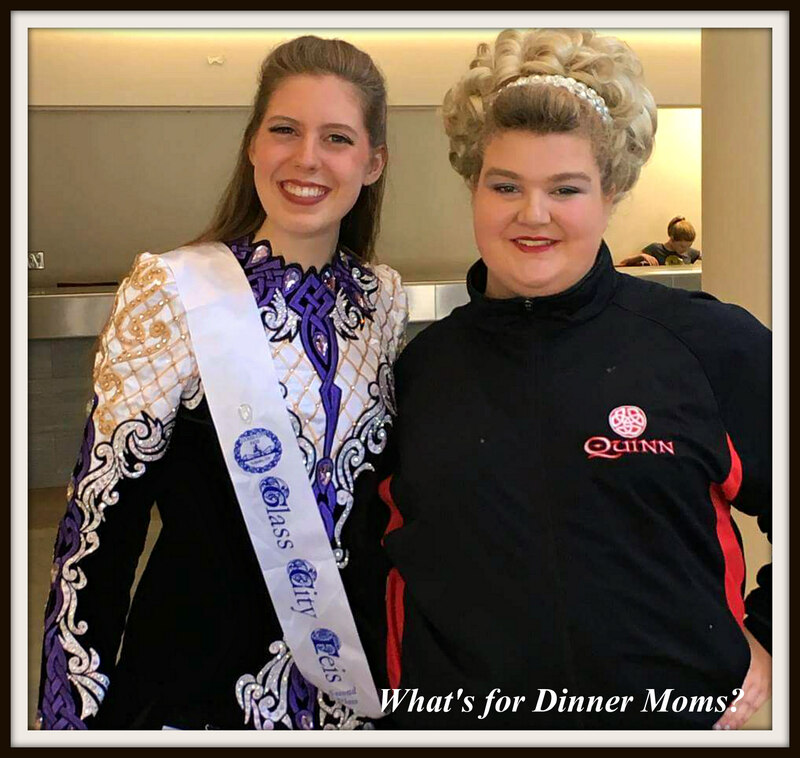 A Weekend in Toledo – What's for Dinner Moms? Every weekend we have been away I plan on blogging about our adventures. They are pretty much the same each weekend that we go to a Feis (rhymes with mesh), an Irish cultural festival usually refers mostly to a dance competition now a days. This weekend the Glass City Feis and the Great Lakes Feis were held at the Sea Gate Convention Center in Toledo, Ohio. This is the first time we have ever been to Toledo. It was a nice city as we were driving in but I could have done without all the construction that was NOT well-marked for tourists such as us. Lane ends NOW is not helpful. But, as you can see above our room was huge. The Hampton Inn – North was where several families stayed this weekend. 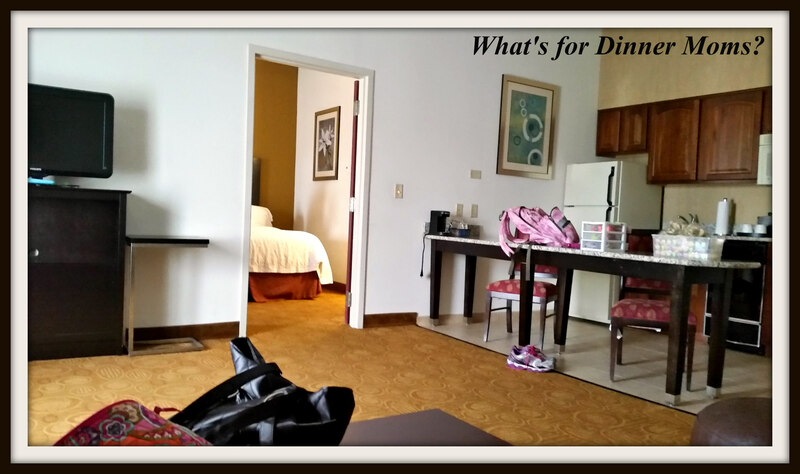 The room was huge and in need of a bit of updating but still decent for the price. The remote for the sitting room television could only change channels downwards. The up button did not work at all. Normally you can hear a bit of noise from people upstairs walking around in hotels but this sounded like they were in the room with us! I had to call to complain to the front desk at one point because they were dancing for two hours overhead. We try to get to our hotel between 4 pm and 5 pm so I am not driving in rush hour in an unfamiliar city. This gives us time to get checked in and scope out the area for food. We like to find a local joint for dinner. I let my daughter choose our dinner spot and she chose Chubby’s American Grill. It was billed as a restaurant and sports bar offering American food. As we walked into the restaurant it was a bit musty and definitely had that bar feel about it. It was 5 pm and dark inside but was lit by all the televisions turned to sports events all around the edge of the interior. There were a banquet of windows but they were covered by shades. As we were led to our table (no waiting – a bonus!) it had the definite smell of old lady perfume or a heavy floral bathroom air freshener. Both my daughter and I noticed this as we sat down. The smell seemed to fade the longer we were there but I think we just got used to it. The menu was plentiful and all sounded delicious. We decided to start with the Chubby Fries (shown above) and the Reuben Balls (shown below). The fries were house made with homemade cheese sauce, bacon, tomatoes and we ordered ours with the onions on the side (because my daughter hates onions). They were good. The best part was the cheese sauce was real. The Reuben balls were yummy! I want to figure out how to make these. 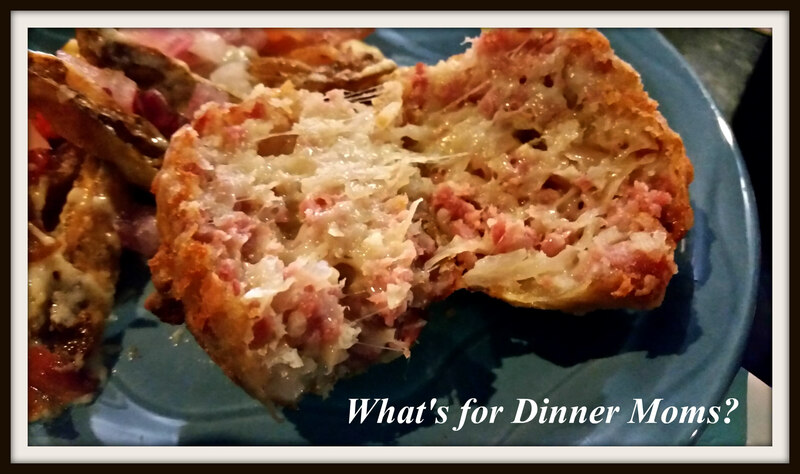 They were corned beef, sauerkraut, Swiss cheese and rye bread rolled in bread crumbs and fried. They were served with a side of Thousand Island dressing for dipping. I even cut one in half to have a picture when I try to figure out how to make them. This was the salad we ordered to split for our dinner. 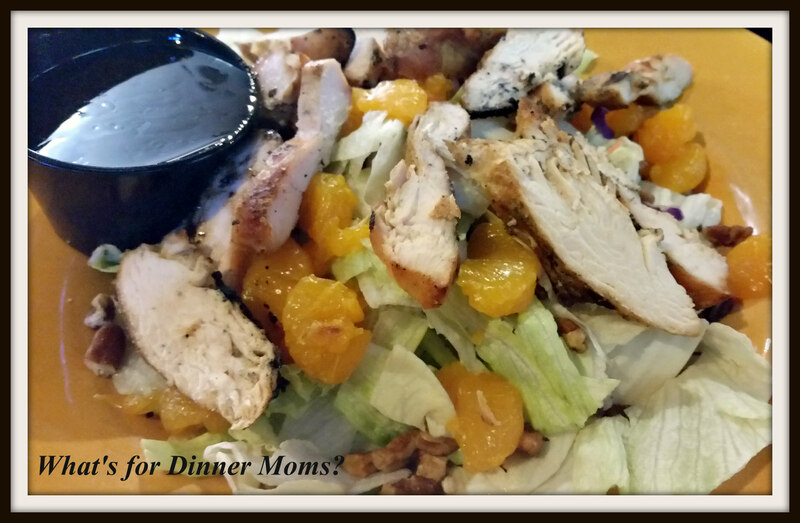 It is a Maple Grilled Chicken Salad. The description was garden greens, Mandarin oranges, red onion (which we ordered on the side), and candied pecans tossed in a maple vinaigrette. Overall the salad was okay. But, if they had substituted a mixed greens and spinach for the iceberg lettuce it would have taken this salad to a whole new level. With the lettuce it was served with it was meh but it could have been so much better. Would we return? Probably but not to order a salad just more of the appetizers. So, on Feis day we spend quite a bit of time waiting around between dances. 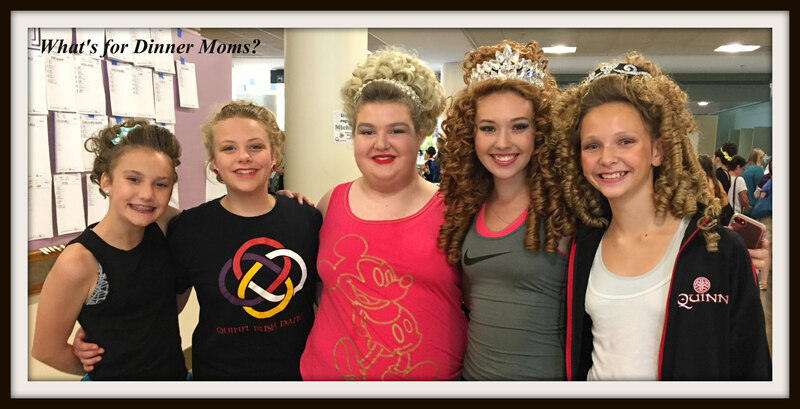 Most Feis begin at 8:30 am and depending on the level or age of the dancer you may be there all day, as we are. We arrived at the convention center about 8:00 am and finally left about 4:15 pm. My daughter was in the last dance on her stage on Saturday. So, there is quite a bit of down time to talk to others, read, or just walk around. My daughter spends most of her time between her dances watching her friends from her dance school in their competitions. The nice part about Feises is that you start to see the same dancers and their families at the various Feis. This is my daughter and a friend of hers from the dance school she used to dance at in New York. They made a promise that it would not be a year and a half before they saw each other again. It is nice to see and catch up with friends from all over. Afterwards we are generally VERY hungry. I found a Spaghetti Warehouse near the Feis site and we headed over there for dinner on Saturday. We used to have a Spaghetti Warehouse in Rochester, NY but it left in the late 1990s and I haven’t been to one since. I was interested to try it and so was my daughter. We decided to order the Ultimate Feast for Two as we were really hungry and it offered a bit of several different items to try. We were brought the piping hot bread with plenty of garlic butter. I wished the butter had more garlic in it but I understand they are trying to appeal to a wide variety of palates. Our dinner came with two side salads that were the usual iceberg lettuce, tomato slices, onion, and pieces of red cabbage. Generic. The platter was HUGE! We were amazed at how big it was. There was Chicken Parmigiano, Lasagna, Spaghetti with Sauce, Cheese Ravioli with Alfredo Sauce, 2 Italian Sausages, 2 Meatballs and garlic bread. We ate less than half of the platter and took the rest to go. The star on the platter, for both of us, was the Cheese Ravioli with Alfredo Sauce. It was creamy and flavorful. We ate ALL of that. The Spaghetti was well cooked but could have used a bit more sauce and spices in the sauce. The Chicken Parmigiano was juicy but again could have used LOTS more sauce and cheese. 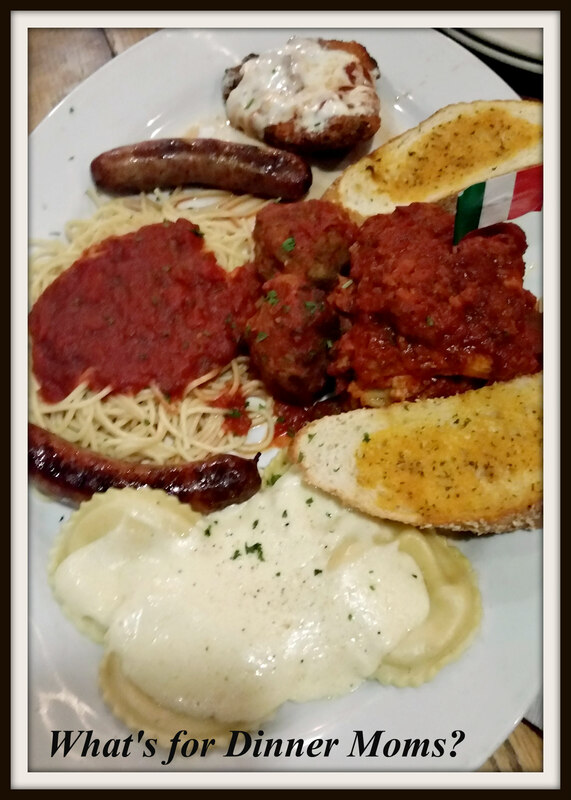 The sausage and meatballs were good. The part that made me smile was because my daughter said, “Your lasagna is much better.” She was right. This had lots of layers (15 according to the menu) but it needed more flavor in the sauce and the Italian sausage was very mild. Overall we were pleased with the amount of food in our meal for the price we paid. Though we wished for more flavor in the sauce, which would have brought the entire dish up a level or two from just okay and that they had freshly grated cheese from the servers to put over the dish. The little jars of cheese at the table are just not the same. Will we go to Spaghetti Warehouse again? Yes, but we may just order the Cheese Ravioli with Alfredo sauce. The second day of the Feis. Is pretty much the same as the first only they try to move things faster so you are out of the Feis at a fairly decent time. I think this was the first time I can remember being on the road at noon to head home. It was wonderful. We will definitely be heading back to Toledo to visit when it is not a Feis weekend. There are so many things we wanted to do and restaurants we want to try. I can’t wait to get there again! Funny, I just stumbled across a Reuben ball recipe yesterday. I may have to dig it up and see if it sounds like what you had. Thank you! I hope it is! I am looking at different recipes and thinking of how to combine them to make this dish. Lovely pictures! You sure are busy Marci! Thank you! It was delicious. Now if I can create it…..